The working men and women of the AFL-CIO join the Union Veterans Council to wish all a safe Memorial Day weekend. This is a time to respect and remember those who gave their lives for the bedrock freedoms of our nation. Let’s resolve to honor their sacrifice by redoubling our efforts to secure and make real those freedoms for every worker in America, so working people can win new economic rules built on broadly shared prosperity. Join the Northern Plains United Labor Council and the North Dakota AFL-CIO for the kickoff of our Labor 2018 member-to-member political education campaign. 1:00-1:30 Pizza, Pop, and a Plan - Labor's goals for this election cycle, and how we can work together as North Dakota union members to accomplish those goals and build power for working people. 1:30-2:00 Canvassing Training - Learn how to doorknock and phonebank! 2:00-5:00 Kickoff Canvass - Doorknocking union members in in Fargo for labor-endorsed candidates! FARGO—U.S. Sens. 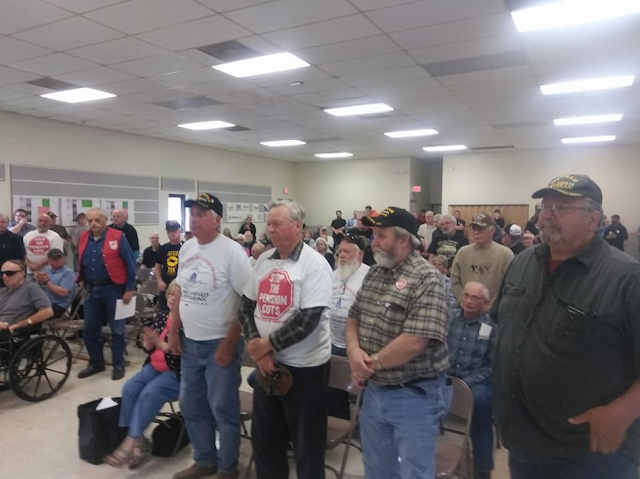 Heidi Heitkamp, D-N.D., and Tina Smith, D-Minn., joined more than 80 workers and retirees in Fargo on Saturday, May 12, to provide updated information following the second meeting of a House and Senate Joint Select Committee tasked with solving the crisis facing pension plans across the country. FARGO, N.D. — U.S. Senators Heidi Heitkamp and Tina Smith spoke with several retired workers in Fargo to discuss pension reform. The two Senators are part of a bipartisan, joint Senate–House committee whose goal is to solve the pension crisis. Letter Carriers across the country collected non-perishable food along their routes today for delivery to local food pantries. The carriers’ union, the National Association of Letter Carriers (NALC), organizes the food drive each year. (CNN)The nationwide fight for more school funding has now swept North Carolina, where teachers are planning to skip school and confront lawmakers next week. On May 16 -- when the Legislature comes back in session -- hundreds of schools will be closed to students while teachers join the March for Students and Rally for Respect in Raleigh. The North Dakota AFL-CIO convention is coming up fast and we’d love to have as many members as possible attend and take part. The convention will take place at the Fargo Ramada Hotel and Conference Center on May 17th and 18th. See all you delegates this week!